Pulmonary Fibrosis encompasses a group of lung disorders which share the hallmark of fibrosis or scarring of the lung. The single most prevalent and devastating of these disorders is idiopathic pulmonary fibrosis (IPF), a severe and progressive lung disorder with a median survival of only 2-5 years from diagnosis. Funded in 2017 by the Australian National Health and Medical Research Council, our Centre of Research Excellence in Pulmonary Fibrosis aims to build research capacity in this area. The CRE-PF will enable our nationally coordinated, clinically focused research program to address the urgent need for more effective, personalised approaches to identify and better manage fibrotic lung diseases, as well as to educate the public and train future generations of researchers in pulmonary fibrosis. It is very rare to witness a disease move from the untreatable to the treatable. This is a unique once in a lifetime moment in the world of PF. The CRE-PF team are extremely well placed to grasp this research opportunity based on our collaborative track record internationally, as well as our unique and globally renowned established infrastructure and research platforms nationally. The CRE-PF is a powerful vehicle to fast track the transformative changes needed for the diagnosis and management and research of PF, keeping Australia at the forefront in the field internationally. 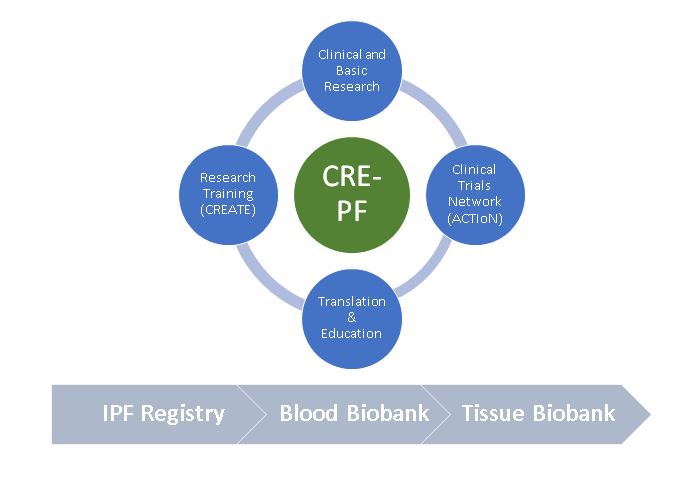 The CRE-PF enables a nationally coordinated, clinically focused research program to address the urgent need for more effective, personalised approaches to identify and better manage fibrotic lung diseases, as well as to educate the public and train future generations of researchers in PF. 1) Generate the first complete epidemiological map of disease burden and natural history in Australia and extend current efforts to develop a model to predict patient outcomes in pulmonary fibrosis. 2) Develop strategies to enhance and extend Quality of Life, reduce patient/family suffering, develop cost-effective adjunct therapies and reduce burden on healthcare. 3) Ensure consistent implementation of world’s best practice for diagnosis, clinical phenotyping and disease management for PF across Australia. 4) Develop and maintain educational support resources for patients and community partners. 5) Develop and implement a national training scheme for Respiratory Research (CREATE). The Centre of Research Excellence in Pulmonary Fibrosis is led by a Steering Committee, chaired by A/Prof Tamera Corte, and 4 subcommittees; Translation and Education (TEDs), CREATE, PACT, and the National Lung Biobank. The Steering Committee makes decisions regarding the prioritisation and implementation of research, including ensuring there is no duplication of research efforts, as well as the administration of CRE-PF funds. The CRE-PF Steering Committee Terms of Reference can be downloaded here. The CRE-PF Project Manager, Dr Alison Hey-Cunningham, provides administrative support through coordination of day-to-day activities to facilitate collaboration between CR-PF members and the implementation and delivery of CRE-PF’s research and communication strategy.